This document was presented to Antoine Burada by his uncle, George Campbell. George Campbell was the "half-breed" son of Vance Murray Campbell, a fur trader and U. S. treaty interpreter, who fathered several children by the daughter of No Heart, an Ioway chief. Their daughter Emily (sister of George) married Michael T. Barada. Their son Antoine Barada (1863-1924) of White Cloud, Kansas, was one of several by that name in the Ioway and Omaha tribes, so he is not to be confused with his first cousin Antoine Barada (1807-1885) of Barada, Nebraska, a celebrated figure in that state's folklore. This is the Antoine Barada who signed the treaty between the United States and the Kansas Nation, at St. Louis, in 1815. The document is addressed to "de la Nacion Ayoas" - the Ioway nation - and was signed by Colonel Don Estevan Miro, who was the Spanish governor of Louisiana during the period when it was secretly deeded by the French to the Spanish. It was presented to the Iowa Nation at the Spanish Office of the Province of Louisiana, at New Orleans, March 15, 1784. This document was donated to the Kansas Historical Society circa 1905 according to the Transactions of KSHS, vol. 9 (1905-1906), p. 251, note 55. This document was presented to Antoine Burada by his uncle, George Campbell. George Campbell was the "half-breed" son of Vance Murray Campbell, a fur trader and U. S. treaty interpreter, who fathered several children by the daughter of No Heart, an Ioway chief. Their daughter Emily (sister of George) married Michael T. Barada. Their son Antoine Barada (1863-1924) of White Cloud, Kansas, was one of several by that name in the Ioway and Omaha tribes, so he is not to be confused with his first cousin Antoine Barada (1807-1885) of Barada, Nebraska, a celebrated figure in that state's folklore. This is the Antoine Barada who signed the treaty between the United States and the Kansas Nation, at St. Louis, in 1815. 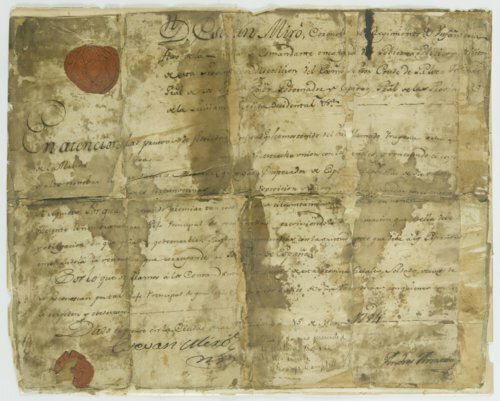 The document is addressed to "de la Nacion Ayoas" - the Ioway nation - and was signed by Colonel Don Estevan Miro, who was the Spanish governor of Louisiana during the period when it was secretly deeded by the French to the Spanish. It was presented to the Iowa Nation at the Spanish Office of the Province of Louisiana, at New Orleans, March 15, 1784. This document was donated to the Kansas Historical Society circa 1905 according to the Transactions of KSHS, vol. 9 (1905-1906), p. 251, note 55.